A December 2017 Christmas calendar of activities, displaying what one person described as a cartoonish illustration of ”…a slave lady” – complete with black skin, big pink lips, bulging eyes, a handkerchief wrapped around her head and dressed like Butterfly McQueen’s character from the classic Southern antebellum film, “Gone With the Wind,” - was reportedly distributed to residents of the predominately-white Bradley Creek Assisted Living facility at Carolina Bay in the past several days. Local and state NAACP officials are furious, and want immediate action, even though the calendars have reportedly been already removed from the facility. The racially offensive calendar illustration is seen on the right side underneath the official logo of “Bradley Creek at Carolina Bay”, which also displays an illustration of a tropical pelican. Under that is a green stripe with “1920’s” displayed, and under that, framed with a thick red border is the racially-sensitive illustration of the “mammy,” standing with her back to a window with a Christmas wreath hanging, holding what looks like a long spoon or ladle in her right hand, and a tray in the other. The “mammy” is also wearing a full apron, and appears to be addressing whomever is viewing the illustration. Following that, tips on protecting one’s self against the cold weather are listed in a green box. Under that, a red rectangle with the words, “Facts about December,” followed by an empty green rectangular box. 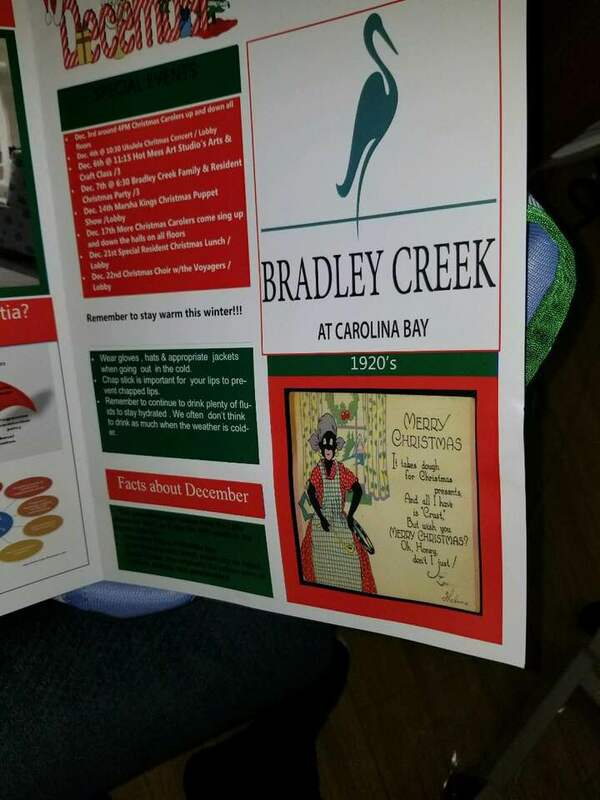 The total design of that page of the Bradley Creek at Carolina Bay December calendar is white, red and green – traditionally considered a festive Christmas holiday color combination. However, the calendar so offended at least two of the African-American staffers there, that they complained to management, forcing the calendars to be reportedly collected back from the residents. 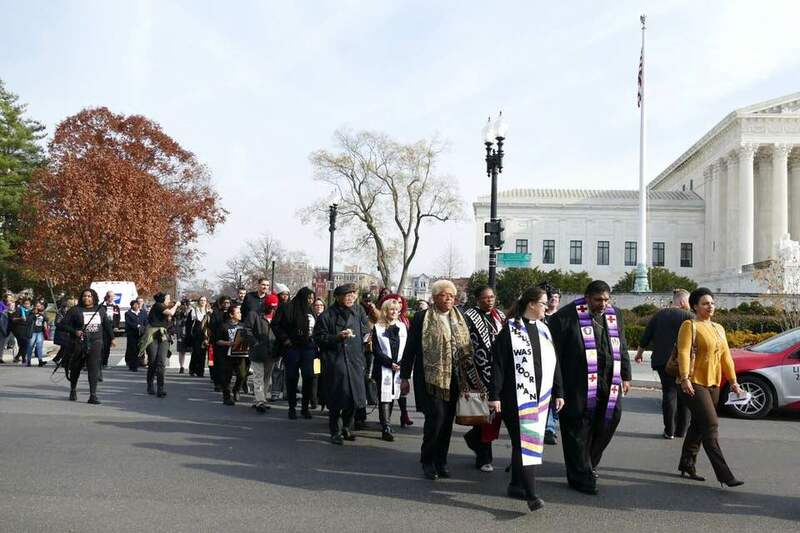 But not before one of the black staffers took a picture of it, and gave it to Rev. Kojo Nantambu of the NCNAACP, who, in turn, brought it to The Journal. Nantambu later secured one of the actual calendars, and brought that to The Journal as well. Jackson said she was unaware if any of the residents complained about calendar. But a “black housekeeping guy” actually complained to management before she did. “I was like, ‘Why would somebody do this?,’ and she was like, ‘You know my heart,’ and she kept saying that she didn’t mean [any] harm by it.’ Well how did you think people were going to take it?” Jackson recalled asking rhetorically. On Wednesday, when Ms. Jackson spoke with The Journal, she said that she “got a phone call at 5 o’clock…”, that afternoon, presumably from Bradley Creek management, telling her that she was “suspended until further notice.” Ms Jackson, who has been working at Bradley Creek for about a year, went on to say she was told the reason for the suspension was a “resident complaint” that she says she knows nothing about. Officials with both the local and state NAACP were aghast when they saw the calendar picture, and were apprised of the details. The Wilmington Journal, after being alerted by Rev. Nantambu about the calendar, and speaking with Ms. Jackson, called Bradley Creek Thursday morning for comment, and confirmed that the Activity Director working there was a “Jennifer Dicicco Alaimo,” whose name was derived from her Facebook page. Then The Journal asked to speak with the head administrator, who was identified as Melissa Crouch. After at first telling the receptionist that she would speak to The Journal later that afternoon – which was not acceptable – a woman identifying herself as Ms. Crouch finally came to the phone. When told of the calendar and given a description of the black “mammy” illustration on it, Crouch replied, “I did see that” when further asked if she was familiar with it. When told that Activity Director Jennifer Alaimo is alleged to be the one responsible for the calendars, and asked how such an error in judgment could have taken place in the first place, Ms. Crouch stopped answering questions, and suggested that a list of The Journal’s questions be sent to the corporate office for response. 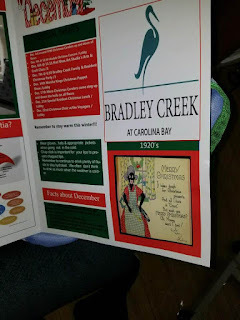 The administration and management of the Bradley Creek Health Center became aware this past Monday of an offensive image that was unfortunately included in a monthly resident calendar that had been distributed to the residents last Friday December 1st. The calendars were immediately removed from the facility. The owners, management and administration of Bradley Creek are deeply embarrassed by and sincerely apologize for the use of this image and the pain it has caused. The thoughtless choice by one employee to use this image is not in any way a reflection of this organization’s values or culture. The Wilmington Journal is following up with written questions to COO Wilson for a subsequent story. TAKE BETTER CARE OF YOURSELF (PART 2) – Last week I shared part of a long Facebook testimony I gave on how I’ve combined my renewed faith in GOD, with increased physical activity (working out at the gym at least six times a week, 45 minute each day), and a much better, thoughtful diet (no breads, only fruit for my sweet tooth, no cakes or pies or candies), no soft drinks or ice cream) consisting of fresh Romaine lettuce salads with either fish or chicken for protein, fruit smoothies, and lots of water. As a result, I’ve lost over 50 lbs in the past five months, I feel better, work better, and behave better. And because my faith in GOD has been renewed, I’m compelled to share the blessings GOD has given me after having a stroke three years ago, being diagnosed with leukemia last year, and also suffering from diabetes and high blood pressure. Today, I look and feel ten years younger than I am (and I’ll be 62 in four weeks). So, here’s Part Two of my testimony, and hopefully you’ll find something in it help your rescue not only your health, but your spirit, too! Earlier today as I was preparing to go to the gym for my daily workout, a biblical phrase kept ringing in my head. (I'm paraphrasing) "your body is a temple." To me, this means that our bodies, the living, breathing , heart-beating, blood-flowing shells our human spirits live and work in, are temples for GOD, and specifically the Holy Spirit to live in. Thus, they are NOT meant for us to abuse in anyway. And yet, we ALL do, because our temples (bodies) are also where our hopes, hurts, dreams, sadness, joy, ambitions, love, pain...pain...PAIN...also reside. So, in reaction to ALL of that which resides in us, and more, we either consciously, or unconsciously, abuse ourselves, assuming that we can handle it, and will still live to see another day. It's only after we learn that we have high blood pressure, or diabetes, or a heart attack, or even cancer, that we realize that we've gone too far...and all of a sudden, our temples have a shorter expiration date stamped on them than GOD originally planned. So what do many of us do? We go on diets to lose weight. But some us still keep smoking, or drinking "just a little" we tell ourselves, because afterall, you "have to have a little vice, a little 'fun,' right?" You see, we've equated slowly but surely destroying our bodies (temples) with harmless "fun," when in fact the person we're hurting IS OURSELVES, and ultimately the people who love us, but now have to stop their lives to help us return to normal after we spent time in the hospital, rehab, etc. In my life (yeah, I'm going to switch to beating up on myself now, because I know THAT better than anything else), i was an emotional eater...which is another way of saying I was an addict. Cakes, pies, fried foods, big slices of beef, gallons of sugary soft drinks, sugar, sugar, sugar...that was me, because THAT kind of food became my "friend." I knew instinctively that I could find comfort in that stuff, that It would NEVER say 'no" to me. I was ALWAYS welcomed into my freezer to eat some ice cream, and join with that some cream soda and a slice of cherry pie slightly warmed! Let me sit down at the table...or worse yet, in front to the TV set, with all of that in front of me, and I...WAS...IN...HEAVEN! Didn't care about the aftermath, or what that kind of destructive eating would ultimately cost me...I was IN THE MOMENT, and that's all that mattered. And I artfully justified it...dealing with stress, problems, anger, fear, anxiety, fractured love, tension....whatever. Bad food was emotional "medicine," I thought, and it was my own, personal way of coping, so "mind your own damn business!" Yeah, but eventually, "...my own damn business" became very SERIOUS business. Just back from an international conference at the Vatican in Rome Thanksgiving week, where the focus was on speaking out on issues affecting the poor and working poor, Bishop Barber also assured that the movement he’s calling for falls right in line with the message of Pope Francis. Speaking from Washington, DC Monday near the US Capitol, Dr. Barber, surrounded by supporters and fellow activists, went on to state that twenty-five states, including North Carolina, will be the focus of the non-violent “direct action” against poverty, systematic racism, expenditures on war and ecological destruction. Many observers liken the Moral Revival Dr. Barber is calling for next year to the memorable Moral Monday demonstrations he led as president of the NCNAACP in 2013, when thousands of demonstrator from across North Carolina came to Raleigh to protest what they felt were repressive policies from the Republican-led state legislature in 2013. Approximately 1,000 demonstrators were arrested, but they ultimately inspired similar protests across the country, and as Dr. Barber recently found out during the Vatican conference, even around the world. 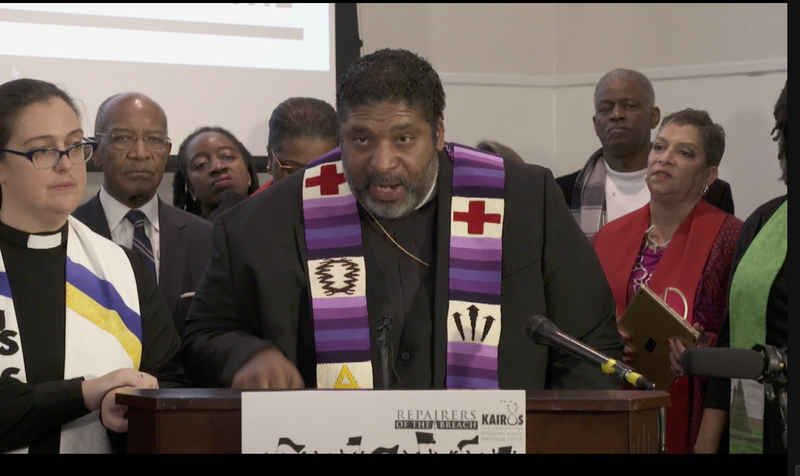 After twelve years, Barber stepped down from NCNAACP leadership in October, though he is still a member of the Executive Committee. 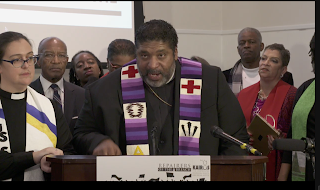 He co-chair of the Poor People’s Campaign, Barber is now traveling the nation, recognized as a national civil rights leader, preparing for the fiftieth anniversary of Dr. Martin Luther King, Jr.’s 1968 Poor People’s Campaign. “The President continues to loudly pit us against one another while quietly deconstructing the government he swore to protect,” Barber continued. If the local elections of November 2017 in North Carolina will be remembered for anything in history, it will be for the number of African-Americans who were elected to positions of leadership in at least three cities, and the county commission of the state’s capital county. Three of the four newly elected black officials were sworn-in Monday night in their respective cities and counties. Their victories are generally being seen as a significant step forward for African-Americans statewide. If there is a perceived “star” in the group, it is Charlotte Mayor Vi Lyles, the first African-American woman to lead the Queen City in it’s history. “I want to be known as the best mayor, to create opportunity for all of us,” Mayor Lyles told a packed City Council chamber moments after she took the oath of office. There’s little doubt that Lyles comes to the job prepared and ready. She’s spent the most of last 30 years working in the city’s budget office, also serving as an assistant budget manager. 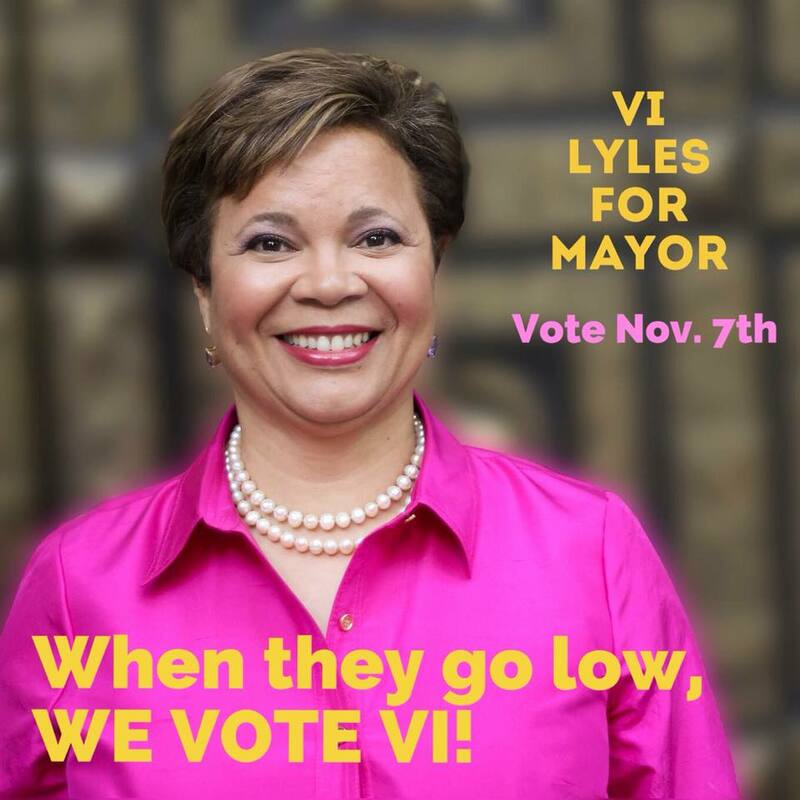 For the past several years Lyles has served on the council, where she became a voice for low-income neighborhoods seeking better economic opportunities. “I’m anxious to serve as your instrument of change,” the new mayor told those gathered Monday evening. In Kinston, not only did citizens in November vote to elect a new African-American mayor, but remarkably voted in an all-African-American City Council. On Monday night, new Kinston Mayor Dontario Hardy was sworn-in by NC Associate Supreme Court Justice Cheri Beasley, along with the rest of the six-member Kinston City Council. “I stand before you filled with great joy, and as a beneficiary of the vote of the people,” Mayor Hardy told yet another packed City Council room. “I stand here today to say, as mayor, I am more than your leader. 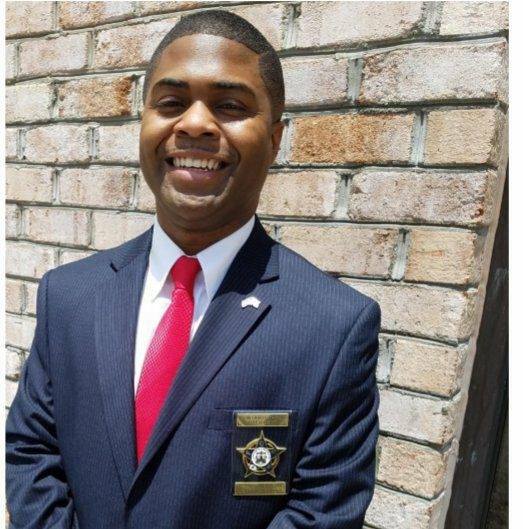 I’m your leader with a servant’s heart,” Hardy, whose November upset of veteran, popular incumbent Mayor B. J. Murphy was a true surprise, added. Hardy is the second black mayor in Kinston’s history. Johnnie Mosley was the first, serving two terms in the early 2000’s. The third black NC mayor who was elected last November, Fayetteville City Councilman Mitch Colvin, will be sworn-in next council meeting. Monday night Colvin watched as his colleagues bid farewell to outgoing Mayor Nat Robertson, who gave keys to the city to council members he served with, and wished Colvin, who defeated him, well. Mayor-elect Colvin, in turn, gave Mayor Robertson a key to the city. “We have had our differences publicly and privately, but for the most part we knew our intentions were the same and that was what was in the best interest of the city,” Colvin told Robertson, as the audience applauded. Finally, a year ago she actually resigned from the Wake County of Commissioners, frustrated with the lack of board progress on issues she felt were important to the citizenry. A day later, supporters convinced her to rescind her resignation. 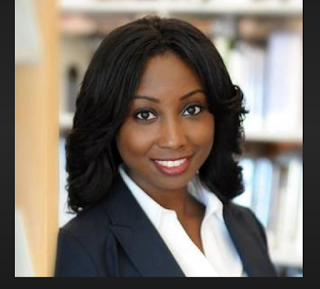 Monday night, Wake Commissioner Jessica Holmes was unanimously elected by her colleagues as the new chairwoman of the board for the next year. Nominated by the outgoing chair, Sig Hutchinson, who will now serve as her vice chairman, Holmes becomes the youngest African-American woman ever to chair the Wake County board, and only the fourth to ever serve. “Today, while our nation and state are in the midst of great political turbulence, caused at least in part by racist voting an criminal justice policies and practices, there is a great need for honest political leaders to speak directly with each other and listen carefully across the table of civility,” Dr. Spearman wrote. Collectively addressing them as the “…leaders of three co-equal branches of NC Government,” Dr. Spearman did give them until Dec. 15th to either call the NCNAACP office, or contact him to respond “if you are open to such discussions…,” but as of Dec. 5th, according to Spearman, it’s been crickets. None of the principles have replied. Apparently, neither the governor, House speaker, Senate president pro tem nor the chief justice of the NC Supreme Court, want any part of a sit down meting with the NCNAACP. On the same day of Dr. Spearman’s press conference announcing his willingness to meet, and releasing the letter he wrote to them, this reporter sent an email to everyone except Chief Justice Martin, asking if they would be willing to meet with the NCNAACP to discuss serious issues affecting the community. They had until Friday, Dec. 1st to respond to the press request, but thus far, as with the NCNAACP, nothing has come by way of a response. What the new NCNAACP president is asking for is not unusual. On the national level, presidents – both Democrat and Republican – have been meeting with civil rights leaders for decades. Pres. Kennedy met with Dr. Martin Luther King, Jr., Whitney M. Young of the NAACP, and other black leaders of the 60’s civil rights leadership. So did Pres. Lyndon B. Johnson. On the Republican side, Dr. King met with Pres. Dwight D. Eisenhower, while Pres. Richard M Nixon also took time to meet Ralph D. Abernathy of the Southern Christian Leadership Conference and other black leaders. On the state level, Gov. Jim Hunt met with various civil rights groups during his terms in office, including a group of ministers from the United Church of Christ, who were lobbying him in the late 1970s to pardon the Wilmington Ten. So what Dr. Spearman, who is also president of the NC Council of Churches is asking for is not unheard of. “We are hopeful that we will get a response to our letter by the 15th of December, but…you can mark me by this, tht if we do not receive anything, we are geared up to move forward, as we have been doing, to do rallies, whatever needs to be done, for such a time a this,” Dr. Spearman vowed. [BLADENBORO] The family of a black teenager whose body was found hanging from an outdoor swing set, which was investigated by federal authorities, but determined not to involve foul play, say they are getting the runaround from Bladen County authorities who apparently have not given back the teen’s belongings. The teen, 17-year-old Lennon Lacy, was found dead in August of 2014. An attor ney for Lacy’s family says the Bladen County district attorney in not cooperating, but the DA counters that he’s asked for a list of the items to be returned, but so far the family has not complied. The attorney, Mohammad Shyllon, says a list isn’t possible because only authorities know what Lennon was wearing when he was found hanging. At press time, the two sides were still at a stalemate. [CHAPEL HILL] THE UNC Center for Civil Rights, founded by late civil rights attorney Julius Chambers, has decided to move away from the UNC System and operate independently in the aftermath of the all-Republican UNC Board of Governors halting its legal work, and the staff attorneys being terminated recently months ahead of schedule. Attorneys Mark Dorosin and Elizabeth Haddix were terminated Nov. 30th. However, they have renamed the nonprofit law firm after Chambers, and will continue to represent poor people, and accept law school interns.